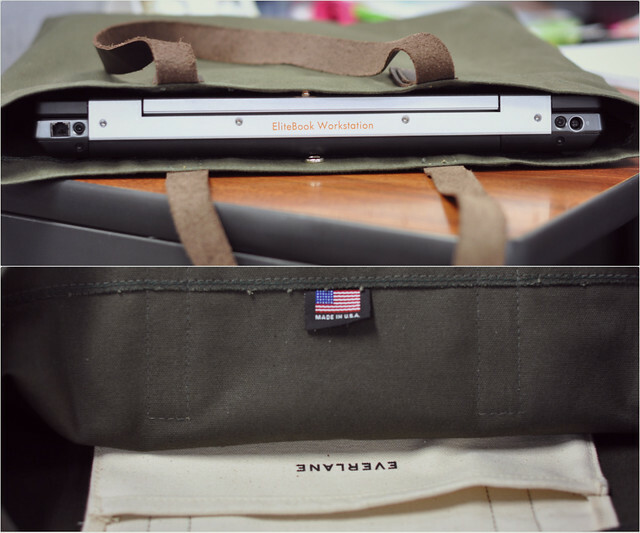 A quick review on this Everlane classic tote - I stopped carrying my work laptop home with me since Madelyn was born. I typically don't do anything work-related when I get home. Between Courtney's school bag, my work bag, Madelyn's diaper bag, the last thing I want to carry in the morning is another work bag. On rare occasions when I need to take my laptop home, this tote is the perfect solution. It weights next to nothing but is extremely durable. It fits my work laptop with room to spare (13.5" H, 3" W and 17" L). The tote has an inside pocket which is handy to store your essentials. It also has a snap button closure to keep your belongings secured. Made in USA. I definitely like the comfort and feel of the genuine leather straps on my shoulders. This tote can be folded when not in use for easy storage (which is also great for traveling). All in all, the classic tote is perfect for anyone on the go. I use it for work, on the weekend as my diaper bag and also as my workout bag. It is truly the perfect minimalist tote. The charcoal is currently sold out online but the burgundy, black, maple, denim and military are still available if you're interested. You always do such great, detailed reviews, Sydney! Thanks for the info on the bag, and I am loving the details on your shoes as well! Very pretty lace top! That is good that you do not need to take your work home too much. That tote is great for carting work-related papers/items around! Love the neutral colors in this outfit. You look so pretty. i just tried out everlane's shirts and am seriously impressed with that company. i love the embroidered top and ivory is perfect for wintertime! @lisacng @ expandng.com They are pin-able now. I always forget to "flip" them. Thanks, Lisa! I'm so in love with the totally neutral palette.....the lace top is so lovely!!! This top is gorgeous. I love the detail!